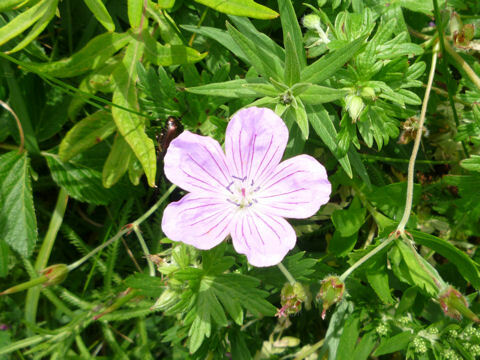 "Ezo-fuuro" (Geranium yesoense var. 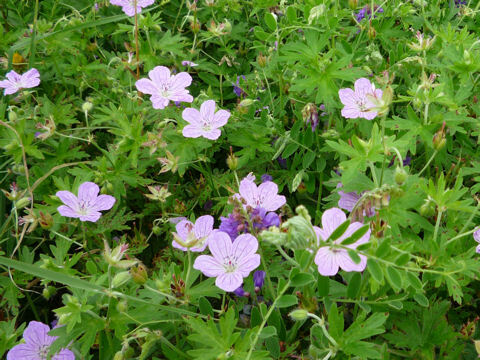 yesoense) belongs to the Geraniaceae (the Geranium family). It is a perennial herb that is distributed northward from Shiga perefecture of Honshu to Hokkaido, and the Kuril Islands. This herb grows in coastal grasslands or mountains, and can reach 30-80 cm in height. The leaves are five partite palmetely and divided into narrow slips. The magenta flowers bloom on the flowering stalks from July to August. It is defined that tha petals are overlapped and the sepals are covered with dense erect hairs.